The real challenge was that I wanted to mix together as many of the stitches that I developed for Bored By Back Stitch as possible, without making it look like I was trying too hard. My decision was to go for symmetry in the middle component, and then to stitch six more that would match each other for size, but would vary in shape, texture, and color. 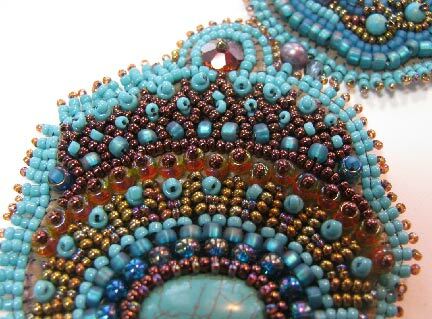 My three main colors, which you can see a bit better in the detail shots below, are turquoise, purple, and copper. 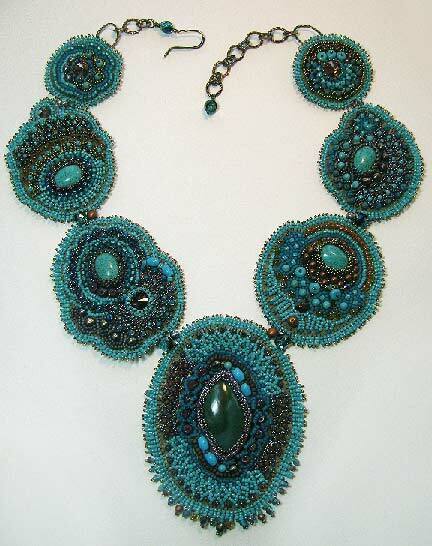 Each of the smaller components features two of these colors, always with turquoise. I'm pleased, but not thrilled. 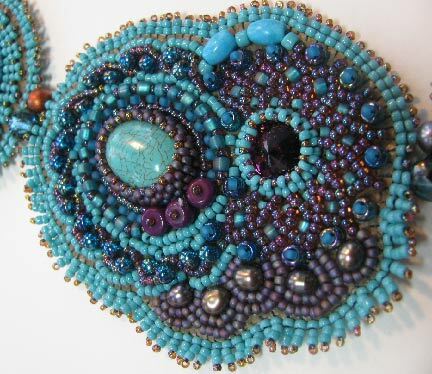 I want to make another piece similar to this and see if I can work up some different ways to combine the stitches. I wouldn't go so far as to say that I'm already getting bored by these stitches, but...well, you know! I'm starting to think that there may be a second chapter that I need to write for Bored By Back Stitch, specifically about combining the stitches. What do you think? Here's a resounding YAY!! for another chapter I just got Nicoles bead backing and I am going to try to make all of your 8 stitches I would love another chapter. You'd definitely be breaking new ground with such a chapter, Cyndi. I don't believe anyone has ever tackled that in print.